Beautiful 1965 CJ-5. 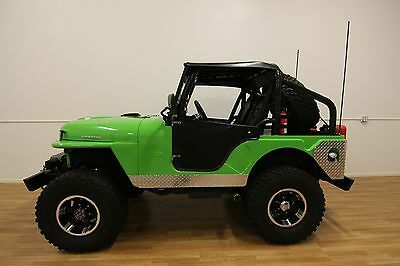 This Jeep has been totally customized yet still retains its original styling. Tuxedo Park mark IV, pretty rare to find these. This is fully capable of doing some sold four wheeling, but has spent most of the time around town. Drives nice and straight, can let your hands off the steering wheel and the freeway. Please let me know if you have any questions. Also, for those new to the process, I can help with scheduling and arranging shipping and walking you through the entire process. Serious bidders only and good luck!Ford 302 3 Speed Manual4X4Dana 28 FrontDana 44 RearFull Gauge setHi-Jack LiftDual Fire ExtinguishersBrand new Wheels and Tires W/ Full SpareFront & Rear Rocker LightsCustom Front & Rear Steel BumpersWarn WinchFront Spot LightsLocking Front HubsCustom Diamond Plate Locking Storage Box Behind SeatsCustom Fabricated Cup HoldersCustom Fuel Can Storage Rack w/ LocksEverything works exactly as it should, zero mechanical issues. Clean title in Hand.